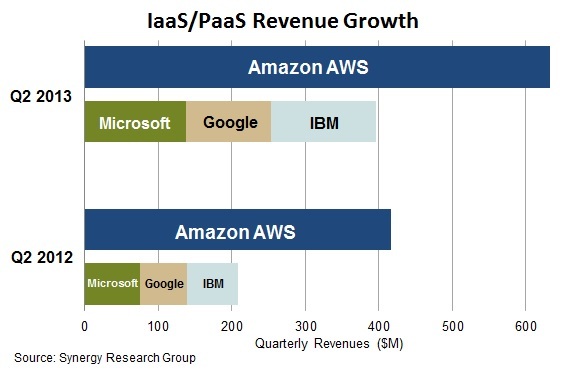 It’s not news that Amazon(s amzn) Web Services is the top Infrastructure-as-a-Service (IaaS) provider, but three big non-Amazon players — Microsoft(s msft), Google(s goog) and IBM(s ibm) — are growing like weeds, according to a new Synergy Research Group report. Using second-quarter revenue data, Synergy found that the non-Amazon big three’s combined cloud revenue is just 63 percent of Amazon’s total. And in a market that grew a robust 47 percent year-over-year, Amazon actually grew its revenue by 52 percent and market share to over 28 percent. The usual caveat must be applied here: Amazon’s IaaS revenues still remain murky, buried in the infamous “other” category on Amazon’s overall earnings report. And sussing out cloud or IaaS revenue is tricky for other providers, too. The Securities & Exchange Commission is looking into how IBM reports cloud revenue and Big Blue probably won’t be the last legacy IT player to face such queries. But I digress. Why isn’t Rackspace in here? Can they really be smaller than all of these others, or is it that they are consider hosting, not IaaS. As Google had no commercial IaaS during Q2/13, do they claim Google PaaS is doing $100M/Q ? Does that even make sense? With the acquisition of OpSource, Dimension Data has formidable Enterprise cloud offering as well.